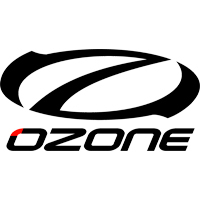 Used 2018 Ozone Contact Water Freeride Control Bar 55cm with 27m race lines and small chickenloop. Push Away Quick Release ? The control system features a new Megatron II push-away quick release safety with total flag out of the kite. The release handle is ergonomic with positive release forces allowing for quick and easy release. Simple re-assembly saves time and gets you back up and riding faster. Two Release Modes ? The Megatron II offers riders a choice of two release modes, the recommended Standard or the optional Expert mode. Anti-twist Flag Out Line and Spinning Handle ? 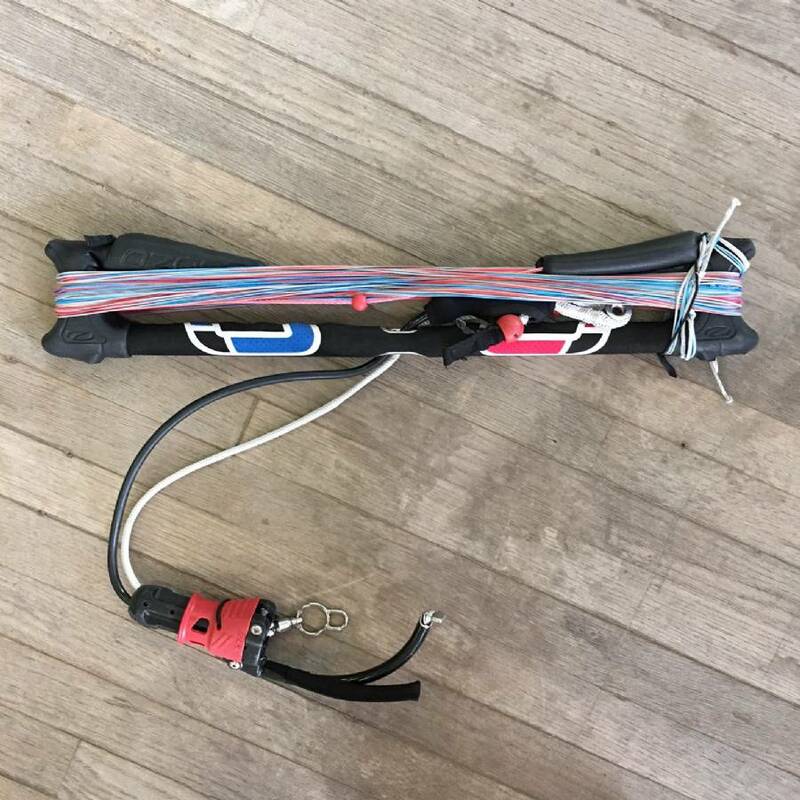 The flag out line running through the Megatron & kite leash attachment at the bottom keeps the leash tangle free when doing rotations and manually unwinding the center lines using the Spinning Handle. Auto Positioning Chicken Loop ? Designed in conjunction with the bar center piece, the Megatron spinning handle auto-positions the chicken loop when unhooking. Soft Bar Ends with Hide-away Elastic Line Retainers ? Soft bar ends for comfort and are less likely to damage lightly constructed boards. Hide-away elastic line retainers keep wound lines secured. Stainless Steel Leader Line Pin ? Superior strength is achieved with a Stainless pin running through the bar. 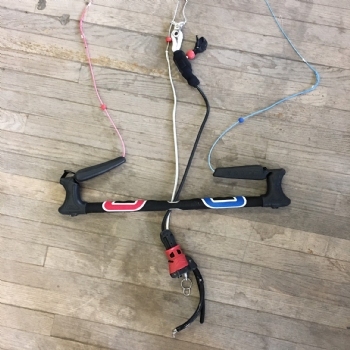 This creates an ultra strong and direct connection between the control bar and flying lines. Low Friction Center Piece ? The control bar features a low friction center piece designed to reduce wear. PU Covered De-Power Line ? The tough PU covered de-power line significantly reduces wear when sheeting in and out. Stainless Steel Trimmer Bracket ? The smooth running trimmer bracket also prevents trim line wear. Clamcleat Trimmer ? Anodized low abrasion Clamcleat trimmer. Bungee Trim Line & Magnetic Handle ? The internal bungee with magnetic handle connects to a magnetic neoprene sock covering the clam cleat to reduce tangles when the trimmer is depowered. Re-launch Balls ? 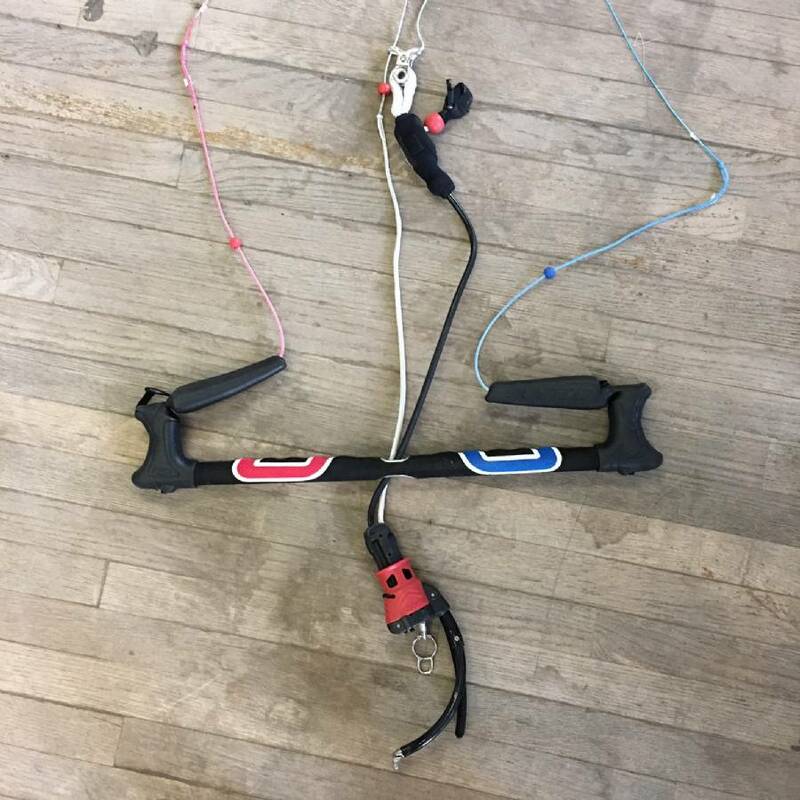 Fixed to the leader lines to pull when re-launching the kite. EVA Grip ? Lightly sanded with ergonomic finger bumps providing the ultimate bar grip.